Book Advertisements for Hindustan Instantly! Welcome to Hindustan Newspaper Ad Booking Portal. Use this portal to book any Newspaper Ad instantly online for Matrimonial, Property, Recruitment, Public Notice at the lowest rates. Pay via Credit Cards, Debit Cards, UPI, Net Banking or Cheque. Worried about getting contacts, rates, deadlines and manual booking procedures for your Hindustan classified ads? Your search ends here- Now you can book newspaper classified text and display ads via releaseMyAd - India's largest newspaper ad booking portal. Just 3 simple steps and your ad is booked for the scheduled date.You can avail the best rates and discount packages for your Hindustan classified ads only at releaseMyAd. Get started ! Q. What are the rates for change of name ad in English and Hindi version of HT, both included? Please provide me with sample ads also. How many copies of newspaper will be provided to me? Q. I want to publish an ad to announce the name change of my son, in Hindustan’s Allahabad edition. Can you tell me what documents I will need to provide you with? Q. I wish to book an ad in Kanpur’s leading daily, Hindustan. The nature of the ad would be classified text, and it would be a matrimonial ad. What is the fastest way to book a classified text ad on Hindustan? Q. I need to place an ad in the Hindustan Classified for Kanpur and Lucknow related to educational institute. Is it possible for me to get a package with lower rates? Q. If I have a discount coupon for the Hindustan Classified, how do I use it? Why advertise in Hindustan Newspaper ? WHY ADVERTISE IN Hindustan NEWSPAPER? Welcome to the Authorised Online Classified & Display Newspaper Ads Booking Service for Hindustan. You can book ads under the Matrimonial, Property, Recruitment and Obituary sections at discounted prices Instantly! Hindustan enables you to publish all types of newspaper adverts like Classified Text ads, Classified Display or column ads as well as Display ads under various categories or sections. These categories may be chosen as per your requirement ranging from Announcements and Education to Public Notice and Tender ads. Hindustan also provides economical discount and combo packages while booking advertisements through the authorised online newspaper ads booking agent-ReleaseMyAd. Now with ReleaseMyAd at your service you can book your ad online in just 3 Simple Steps - Select the Newspaper, Compose your Ad, and Confirm the Dates along with the Payment and confirm their release instantly!!! Authorized Advertising systems of all major newspapers have been incorporated in our services to ensure consistency in flow & availability of dates. All payments made against your ads on the site are handled securely through SSL encryption for maximum protection. HOW TO BOOK AD IN Hindustan NEWSPAPER? 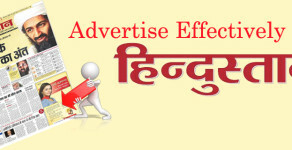 Know how to publish an advertisement in Hindustan under the category of your choice? Lastly just choose the preferred Release Dates & move ahead to clear the payments via our convenient online & offline mediums to receive instant confirmation. The online payment mediums consist of Credit/ Debit Card modes and Net banking, while the offline options vary from Demand Drafts, Cheques and NEFT (Online Cash Transfer) to Cash Collection from home and offices. On successful payment, you’ll receive an invoice with all your ad booking and payment details. Your Times ad is ready to be published on the specified date(s) once it passes through the editorial approval policies of Hindustan. 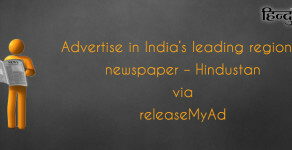 ReleaseMyAd (Authorised by Hindustan) provides you an integrated platform to check ad rates, circulation details, discount offers and book your classified and display ads online for Hindustan instantly! We are India’s largest and simplest online ad booking service providers! Through ReleaseMyAd you can book Hindustan Classified Display, Text Classified and Display ads without any extra charges!!! RMA is a trusted and authorized site for booking advertisements with an experience of 30 years in the field of Newspaper advertising. We have been accredited by the Indian Newspaper Society (I.N.S)- the primary governing council for all media publications. Classified Display Ads: Display Classified ads, also known as column ads and are a little more expensive than Text ads. These adverts can be customized by uploading images and logos and formatting font styles and sizes. CD ads can be published in coloured as well as Black and White format. Not only can you compose your Times Classified Display ad online with our pre designed templates but also upload your personally composed advert. Display Ads: Display ads are the most expensive and elaborate form of advertising. Such adverts have a great potential for creativity. Expert advertisers can upload the design of their advertisement in PDF/ JPEG/ EPS format and simply specify their requirements. For any more details and queries about Hindustan and the booking of your advertisement, please visit the Frequently Asked Questions section or Question & Answer Forum. Classifieds Ad Sections LocationsFAQ Why Hindustan? Want to Advertise in Other Hindi Newspapers?